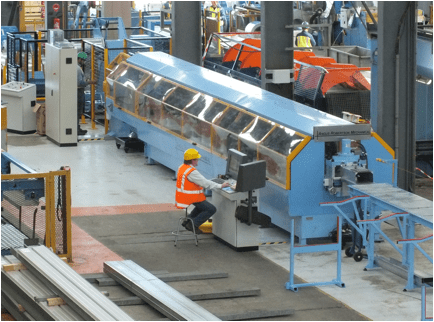 Angus Robertson Mechanical Ltd (ARM) are specialists in the design and manufacture of rollformers, other metal forming and coil processing equipment for a wide range of industries. 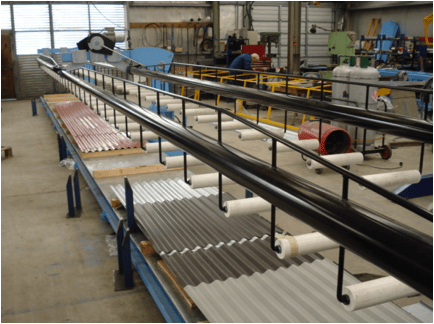 We proudly make the machines that industry uses to form sheet metal coil along straight, longitudinal, parallel bend lines using multiple pairs of contoured forming rollers without changing the thickness of the material at room temperature. Angus Robertson Mechanical Ltd (ARM) will design and manufacture rollformers to your specific requirements. 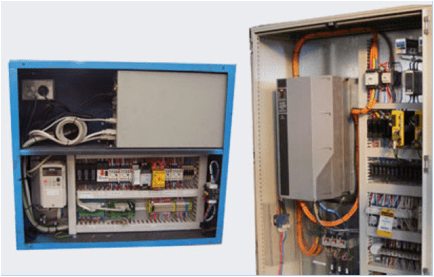 This is based on the product profile, productivity level requirements, materials to be used, coil handling, capital budget constraints and safety standards required for any country. Our designers and engineers will work with you from the project development stage, right through to completion, ensuring you are happy with the end result. Please ask us and we will arrange machines to your specifications. We also offer expert maintenance from staff that are experts in their field. They are used to fixing competitors machines, providing advice on maintenance and upgrading of capitol equipment used by business. We were the first company to offer these services to business and are proud to assist industry during times of breakdowns in NZ, Australia and worldwide. Half Round Gutter (left), Rotary Roll Former (right). Rain Water Roll Former, Spouting /Facia (left), Quarter Round (center), Downpipe Machine ø65-ø80 (right). Self contained machine, coils mounted over the machine, manual shear operation, runs on single phase power. Quarter Round Trailer Mount Spouting. Broad Sheet Roofing Roll Former. 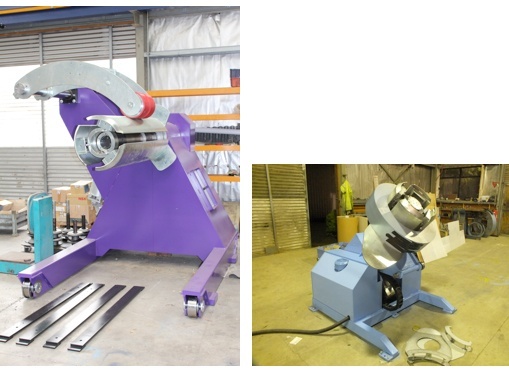 Spouting Machine with Crimp (left), Ridging Machine with Soft Edge Feed (right). Range of control options to suit the application. 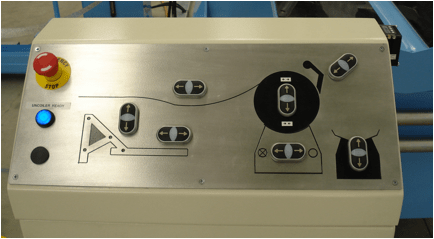 PLC (left), Computer Control Panel (right). Manual Job Entry Screen (left), Machine Diagnostics Screen (right). 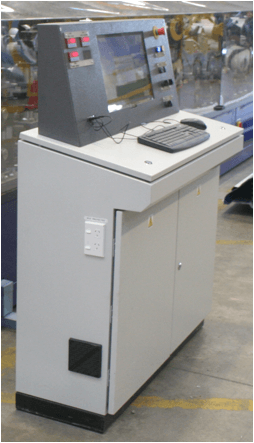 To address the issues in folder productivity, safety and accuracy the automated slitter has been developed. 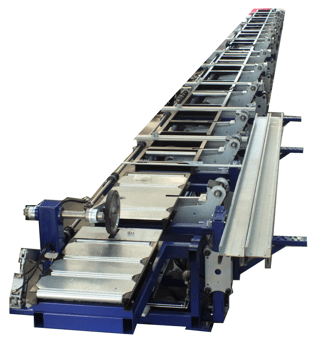 The operator programs the slit widths and lengths required and the autoslitter automatically positions and locks the slitting knives, and feeds out the order in a few minutes. Effectively the processing slits in the same time it would take to for a cut to length system to provide sheets for other equipment to slit. The machine provides strip to stack of flashings on a marking out table. The machine takes slitting operations off the folder, improving operator safety and increasing productivity. 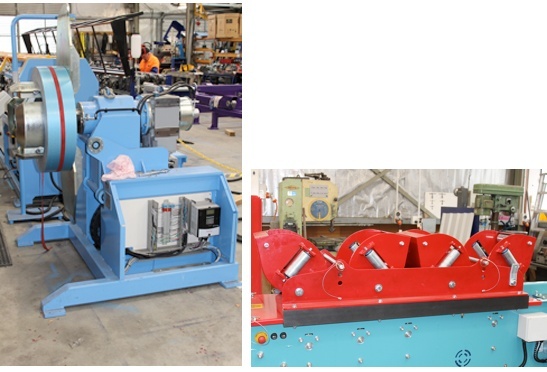 Auto Slitter Shear (left), CNC Auto Slitter (right). The wedge uncoiler has many benefits to the modern rollformer, reductions in coil damage and the factory environment. The industry standard linkage type uncoilers are afflicted by the mechanics of mechanical advantage, which turns out be no advantage at all. The force required to lift a 6 ton coil from closed, is multiplied as the link approaches 90 degrees, such that a force 10 times that can be applied to the inside of the coil as it is clamped. The wedge expand uncoiler has a constant mechanical advantage, so the maximum desired clamping force can be set by a pressure relief valve. The spooling of the coil is by electric motor, providing smooth operation that is gentle on coils, keeping them tight and damage free. Hydraulic driven systems require high flow powerpacks that can be noisy and have problems with heat buildup – leading to inconsistent operation and potential maintenance issues. Craddle Uncoilers (left), Powered Roll Decoiler (right). 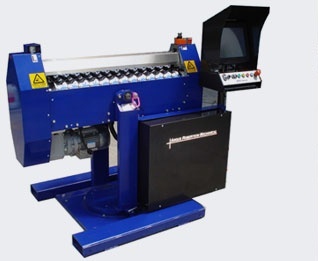 The automated corrugate curver provides accurate, repeatable curving of corrugated iron. To enable smooth transition from straight to curve a computerised control system finely adjusts the feeding of the product and the depth of the rolls. The computer controlled curver automates the production of curved iron. 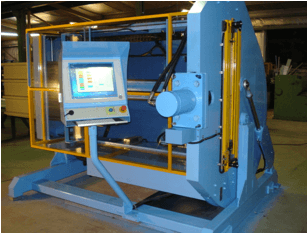 The machine settings for sheet and curve length, roll depth and forming process, and also the position where the curve is to start. When the settings to achieve the customers requirements have been achieved they are saved on the job database. The job can be run then on those setting by lower skilled operators. Due to the consistency of the operation the job can be called up at any future time and replacement or new sheets run next week or next year. 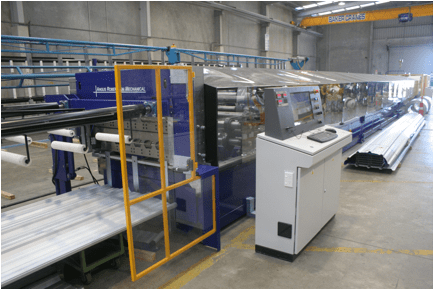 The operator can select job mode, including a system where the operator loads the sheet up to the datum, presses the start button, stands back and the machine processes the sheet, including sizing, feeding to curve start, curving and releasing the sheet. Stop end tooling both flat and drawn tooling available. The diesets are setup to be able to use offcuts from flashing shop, or take coils used from other products. Standalone or to suit your own press shop. 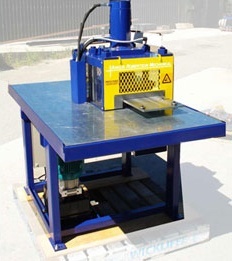 Various punching can also be fitted to rollformers so that finished product rolls out onto the table. To assist operators and to protect your business from OH&S issues.